Capturing two award nominations, this elegant home makeover was personally planned down to the last detail to suit the growing needs of the family without compromising traditional style. This is also the project we’ve chosen to feature on the upcoming RenoTour 2018. Let’s take a closer look. More than a year of planning was involved in this renovation and addition, says Project Coordinator Paulette MacGregor. 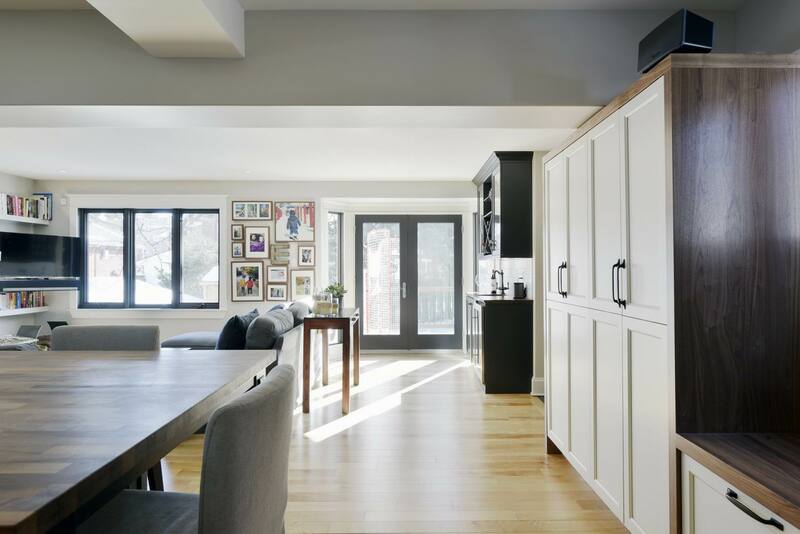 The home was completely renovated from top to bottom, maintaining its vintage connection while transforming it into a thoroughly modern home. 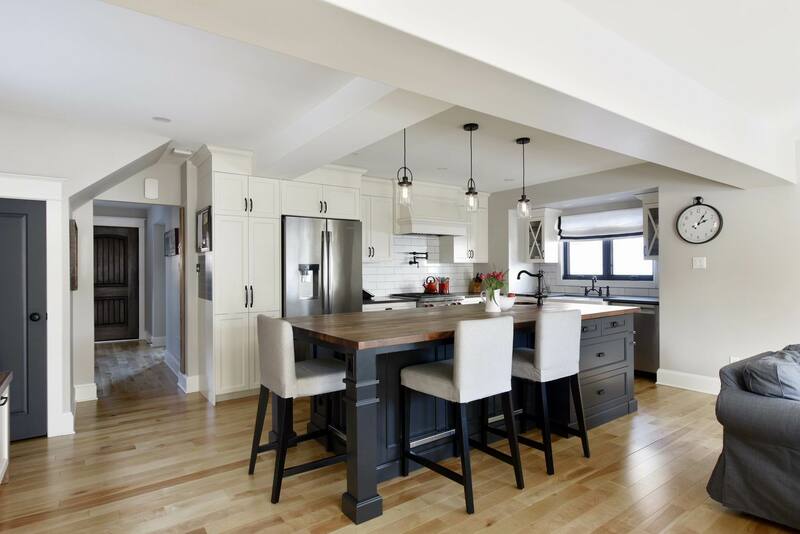 As a result, it’s now up for two Housing Design Awards from the Greater Ottawa Home Builders’ Association: Renovation $350,001 – $500,000 and Custom Kitchen (241 sq. ft. or more) – Traditional $75,001 and over. 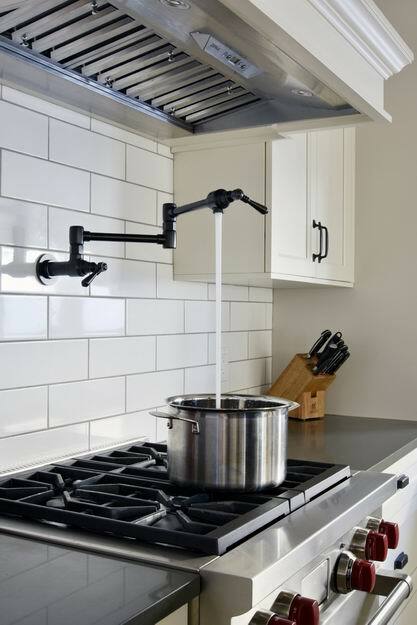 Initially, the owners wanted a kitchen redesign. But the home’s layout became a stumbling block. 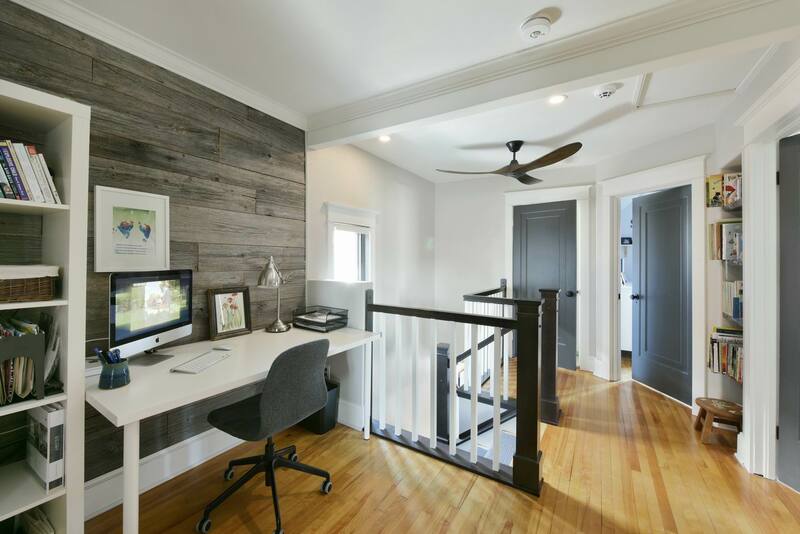 The existing home provided a great footprint, but a previous addition left a choppy layout with divided rooms and several underutilized areas. 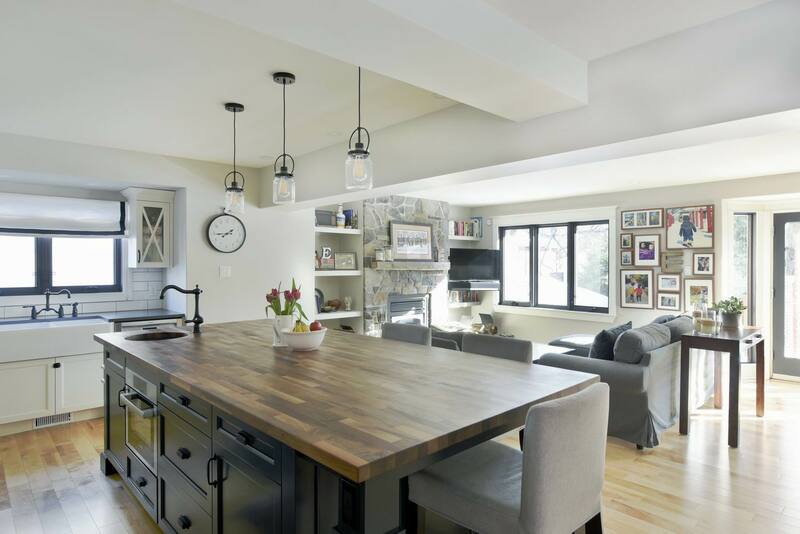 By opening up the main floor and reorganizing the layout, we were able to achieve maximum functionality while creating a large, comfortable kitchen for their busy family. 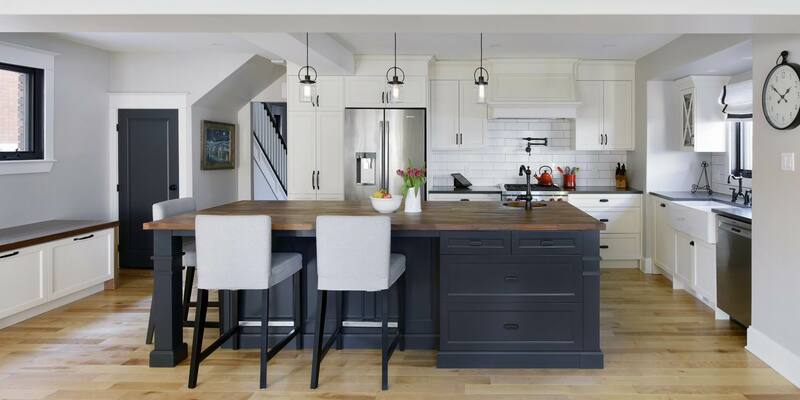 The island is the focal point of the kitchen, painted in a custom black-iron, water-based finish and topped with a rich black walnut butcher block countertop. Moving the dining room created more space for the kitchen, while all remaining walls were removed to have the kitchen open to the family room and mudroom, which are now flooded with natural light. There had been a chimney between what is now the open kitchen and family room. That chimney was supporting the back of the house, making an anchor between the original home and the previous addition. Removing walls and the chimney required careful engineering to redistribute the point load and a steel beam was transported in from Windsor for structural support. The fireplace was relocated to the family room, with the insert and the mantel saved and reinstalled. 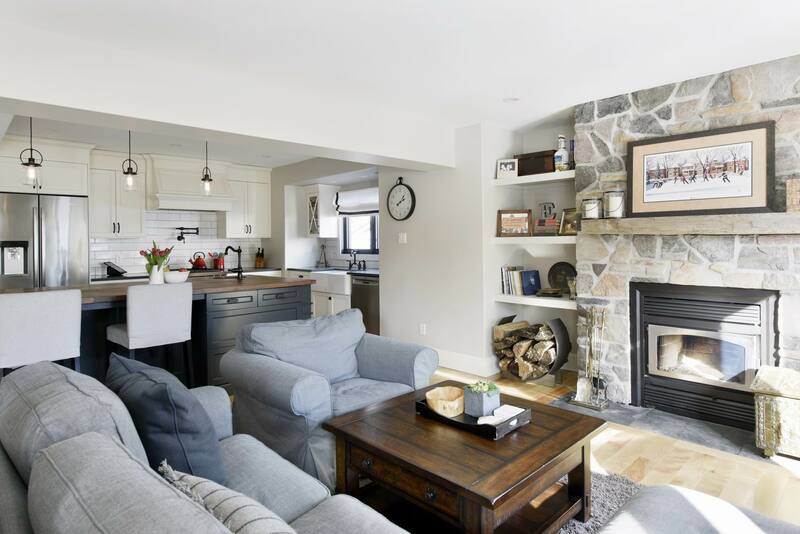 It’s given a traditional flair with a real stone surround. The now-open kitchen is a chef’s dream. There is plenty of prep space, storage, seating and room to circulate. Large island to have a seating area for four people. Drawers in the island beside the dishwasher to make it easy for the kids to unload, as well as set the table. Toe-kick central vac for quick kitchen clean-up. Smaller prep sink facing the living room and out of the way of the main sink. Counter-depth double-door fridge and full-wall pantry to allow easy access for small children. And all of the upgraded selections and finishes were chosen in a traditional style that is timeless. 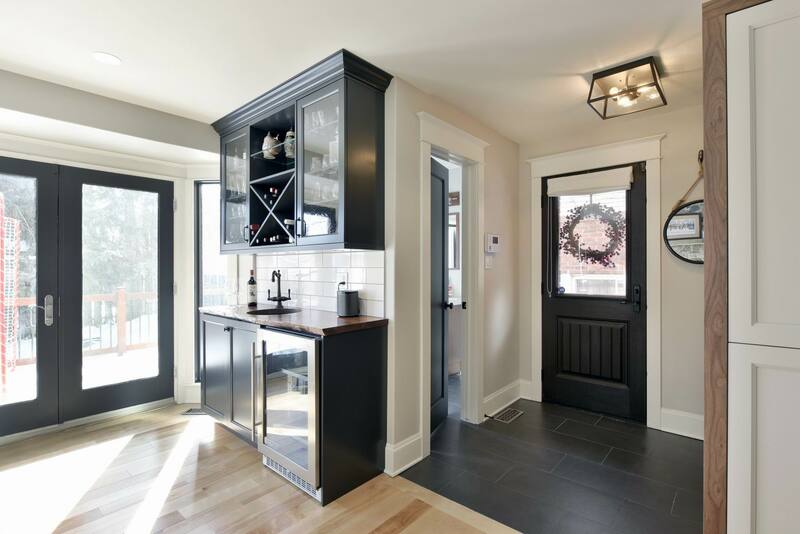 The off-white painted cabinets, warm walnut, and black hardware and fixtures evoke a craftsman style, while a large porcelain farmhouse sink sits perfectly below a black framed window with antiqued glass cabinets on either side. 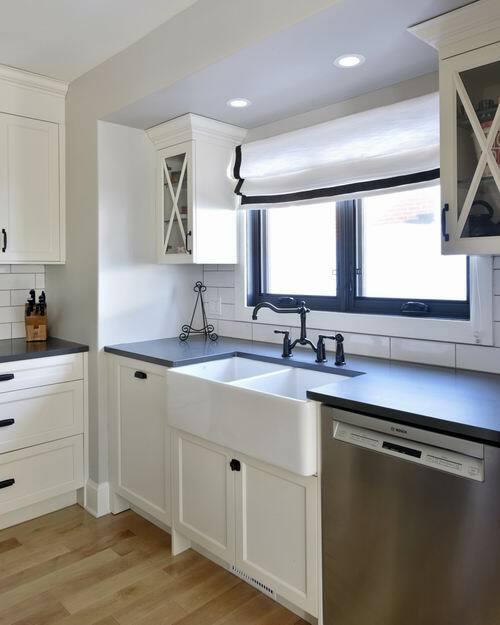 A custom hood fan made to match the off-white cabinetry brings traditional detail and elegance to the kitchen and the traditional white subway tile backsplash is the perfect backdrop for black faucets and dark quartz countertops. The mud room at the side door opens to the kitchen and living area with the powder room beside. The area is designed to match and feel incorporated with the kitchen thanks to the off-white cabinetry and black walnut accents. 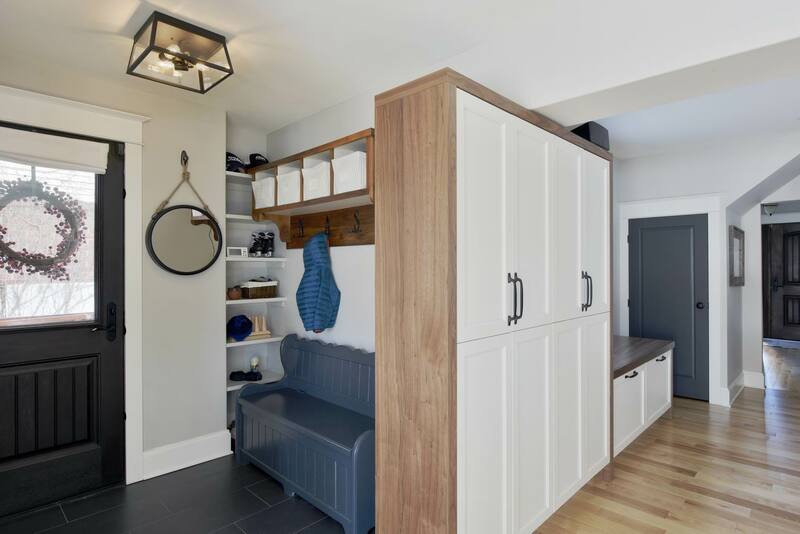 A bench with hidden recycling centre and tall storage cabinets make the space perfect for a family that likes to stay organized and have everything hidden away to keep a tidy looking home. Colours and finishing’s flow with the connected spaces and the rest of the home. With everything opened up, the kitchen and living area can look out to the deck and backyard, letting in tons of natural light. A full-service wet bar with drink fridge in the family room has a live edge walnut countertop matching the kitchen next door, adding to the continuity. The wet bar is open to the entire space to make entertaining easy. The dining room was moved to the front of the house but maintains access through the hall to the kitchen. 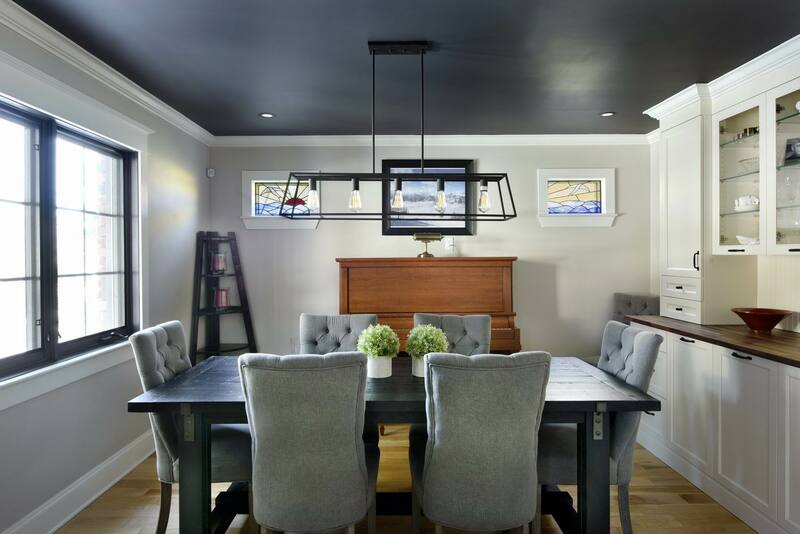 It makes for a space that’s perfect for entertaining away from the food prep area. In the foyer, a curved wood door that was not functional was removed, along with an awkward closet, to create a roomier, more inviting entrance. But to save the historical detail, we had to find ways to tie it back in with the composite wood-looking door, through the strapping and accents on it, for instance. With clever engineering underneath, the new second-storey addition over above a previous one-storey addition avoids the cost of a full two-storey addition, with no need to disturb the newer deck. The addition, which blends seamlessly, made room for a master bedroom, two closets, and an ensuite. The second floor now includes a laundry room, office space, and the master suite.